Persia authorized Yomud Turkmen khanate). in the 1881 Treaty of Tehran. Russian Turkestan Kray (see under Uzbekistan). coalition of various socialist parties. (as part of a federal Russian Republic). Turkestan A.S.S.R. (within Russian S.F.S.R. 6 Feb 1920 Bolshevik forces retake Krasnovodsk. part of the Soviet Union. 24 May 1990 Turkmen is designated as the state language. 22 Aug 1990 Declaration of state sovereignty. 27 Oct 1991 Independence declared (Turkmenistan). 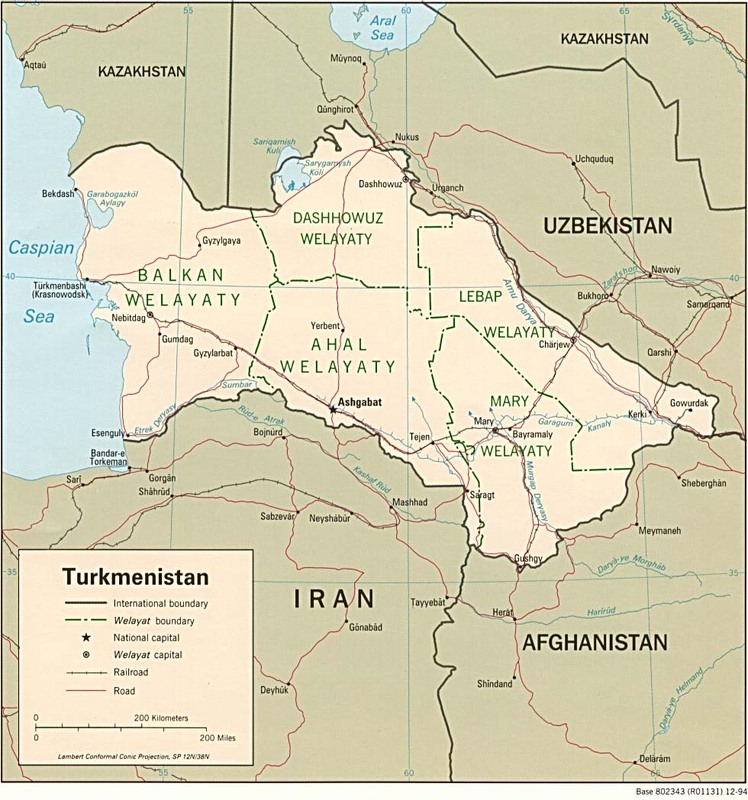 (from 1 Oct 1993) "Türkmenbaşy"
Territorial Disputes: Cotton monoculture in Uzbekistan and Turkmenistan creates water-sharing difficulties for Amu Darya river states; field demarcation of the boundaries with Kazakhstan commenced in 2005, but Caspian seabed delimitation remains stalled with Azerbaijan, Iran, and Kazakhstan due to Turkmenistan's indecision over how to allocate the sea's waters and seabed; bilateral talks continue with Azerbaijan on dividing the seabed and contested oilfields in the middle of the Caspian. 5 Dec 1936 Renamed Turkmen Soviet Socialist Republic. 27 Oct 1991 Turkmenistan, independence declared.